Mauryan Empire Sculptures: The Mauryan dynasty, founded by Chandragupta Maurya, ruled from the 4th century to 2nd century BC in which is regarded as the first empire to have ruled over most of the Indian subcontinent. During the long, notable reign of this dynasty, reached the pinnacle of its political, religious as well as artistic development by the mid of the 3rd century BC. This dynasty represented an important transition in Indian art from the use of wood to stone. It is also notable for a refinement in pottery as well. This period manifested an imaginative and impressive step forward in Indian sculpting. Because of their free-flowing standing nature, the pillars of Ashoka as well as the elaborately carved animal capitals most of the art historians considered them as the examples of sculpture. Coomaraswamy, an art historian, has distinguished court art and a more popular art belonging to the Mauryan period. While the Court art was represented by the pillars and their capitals, Popular art was represented by the works of the local sculptors like Chauri (whisk)-bearer from Didarganj. Art under the Maurya dynasty was a treasure house which comprised of the remains of the royal palace, the capital city of Pataliputra, the stupas at Sanchi, Sarnath, and Amaravati, pillars of Ashoka, potteries, coins, and paintings. The ruins of the magnificent city of Pataliputra near the modern day Patna is extremely crucial for the complete understanding of the whole character of Maurya civilization which Ashoka inherited and perpetuated. Following not only Indian but ancient near eastern instance, The palace walls, the splendid towers, and pavilions were all constructed of brick or baked clay that. These works exhibited not only Indian but also the near eastern influence. However, it’s been a really long time that these crumbled to dust or have been swept away by periodic surges of the waters of the Ganga. The exact picture of the Mauryan period is revealed through its sculpture. The existing monuments reveal the same imperialist and dictatorial character as was the peculiar characteristic of Emperor Ashoka’s rule. Many of these works are quite exquisite which have a distinct style, which was very different from the mainstream Indian art, and displayed the same intimacy of relationship and imitation of the cultures like that of the Hellenistic Western powers and of Iran. Another fabulous sculpture during the Mauryan period is the Sarnath Pillar, which has four lions back to back at the top of the pillar. The extraordinary precision and beauty associated with these sculptures is a fine instance of the expertise that the artisans of that period possessed. The work of local sculptors has set an example of the popular art of the Mauryan period. This also consisted of sculptures which were not even custom-made for the emperor. The patrons of the popular art were basically the local governors and the more well-to-do subjects. This is evident from figures such as the female figure of Besnagar, the male figure of Parkham and the whisk-bearer from Didarganj, though the year in which they were made is not clear. These works express a considerable earthiness and physical vitality. The stone elephant at Dhauli was also probably carved by local craftsmen. The image of the elephant emerging from the rock is one of the most impressive works, and its purpose was probably to draw attention to the nearby inscription. Terracotta objects of various sizes have also been found at Mauryan sites when archeological excavations were carried out in these sites. 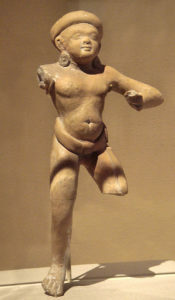 A continuation of the tradition of making mother-goddesses in clay, which dates back to the prehistoric period, was revealed by the discovery of these objects at Mauryan levels during the excavations at Ahicchatra. They are found more commonly from the regions lying between Pataliputra to Taxila. Many have stylized forms and are technically more accomplished, because of their well-defined shape and clear ornamentation. Some appear to have been made from molds, though there is very little duplication found in such works. Terracotta from Taxila consisted of primitive idols, votive reliefs with deities, toys dice, ornaments, and beads while the ornaments so found included round medallions, similar to the “bullae” worn by Roman boys. Ringtones probably associated with a fertility cult have also been found in some quantity. Terracotta images of folk gods and goddesses which have been found having an earthy charm. Art in Maurya period was also noted for its refinement in potteries which consisted of many types of wares. But the northern black polished ware is distinguished because of its developed method and is considered as the trademark of the Mauryan pottery. The coins were also an integral part of the Mauryan art and were mainly made of silver and copper. The coins varied in shapes, size and weight and the common symbols which were used were that of a tree, mountain, and an elephant. Closely following the Indus culture, the most primitive existing architectural heritage in India is that of the Mauryas. The sculptures and architecture during this period are regarded as one of the finest examples of Indian art. The rock-cut caves, stupas, and palaces make the art of the Maurya period as a landmark in the history of Indian art.